Société Auguste Vestris - Emmanuel Thibault - Gatecrashing the Cocktail Party ? Emmanuel Thibault - Gatecrashing the Cocktail Party ? Emmanuel Thibault is a Frenchman, born in 1974. After early classes with Max Bozzoni, he entered the French National Theatre’s School, where he was educated. At the age of fifteen, he was admitted into the Paris Opera’s troupe, and there chose to study with Noella Pontois. He thereafter won a string of international events and rose, by the age of seventeen, to soloist rank (sujet), the youngest such appointment in the troupe’s history. At the Concours interne de promotion held on December 23rd 2004, M. Thibault was appointed premier danseur. Silver Medal, Concours international de Paris, 1990, Gold Medal, Eurovision Young Dancers’ Competition, Helsinki 1991, Espoir Prize, AROP 1994 ; Silver Medal, Varna (year unknown). Prix de l’AROP, 2002. Of the first two casts presented, although Mathias Heymann’s youthful natural talent and superb technique may dazzle, he fails to give the role its full dimension. What might be lacking? Precisely what Emmanuel Thibault brings to the role: his soul, a simple ease and directness in the remarkable work of the arms and hands, that pertain to the realm of unreality, poetry, of dreams - not "belle danse" alone. "But the true and great surprise of this "Beauty", that makes every penny spent on one’s tickets more than worthwhile, and that sweeps all else before it, go by the names of Emmanuel Thibault and Claudio Cocino. The premier danseur of the Paris Opera inhabited with mastery, distinction and virtuosity a role that comes naturally to him, the Blue Bird, his partner the excellent Sara Loro, a very sensitive ballerina who made a delightful impression. This Thibault is a true phenomenon (....) what a masterful lesson in style and technique - what ports de bras ! this shall ever remain graven in one’s memory." "Emmanuel Thibault, a dancer of the very first order, who, with an extraordinary interpretation of the Blue Bird, creates emotions for which words fail one, and leads one to forget all the crass pettiness and foolishness that tarnish so wonderful an art form." at Tokyo with Kinuko Shimada as Aurora, for the Inoue Ballet Foundation. "A performance of note in Tokyo, in late July, was the first Prince Désiré by Emmanuel Thibault. The charming premier danseur with the Paris Opéra Ballet stood in for the Royal Ballet’s Thiago Soares when the original guest for the Inoue Ballet Foundation injured himself and was forced to withdraw. "His longing for Aurora is intensely expressed by his back, with an ecstatic yet academically polished arch, as well as arms yearningly stretched towards the ethereal princess (...). Although the small stage did not allow him to tour across with full-scale leaps, each movement of his limbs and head from one position to another is smooth, precise and rich in subtleties. "In the final act, in contrast, he has proven his quality as a classicist. When he puts his feet in a perfect fifth position and opens his arms upwards, it is an act of realising the idea of proportion and harmony within the living human body. It is quite rare that a dancer can radiate this dignity without sacrificing a bit of his innate freshness and calm." In Dance Europe, ’Bouquets and Daggers - Dance Critics from around the world recall last season’s outstanding performances’. "Thibault and Ould-Braham - Outstanding Partnership for their Don Quixote in March 2007"
"Outstanding performance by a male dancer" for his performance in The Sleeping Beauty at Tokyo. "Myriam Ould-Braham made her début as Kitri alongside a partner who sets the stage on fire , as fine a technician as he is an actor, Emmanuel Thibault. Without ever disrupting the lyrical quality of her dance, the premier danseur, who will dance with her again on March 31st, quite broke through her reserve. Their partnership thrilled the Bastille public." "I too am struggling from a daze. That a ballet like ’Don Quixote’, little more than flash-and-dash, might inspire feelings of purity and nobility, is a phenomenon of transfiguration, due to these interpreters. Last night, the Paris Opera pulled from under a bushel what it may never have suspected to be the company’s brightest light : a couple in perfect harmony. A grave, though delightful cooing of doves, as though hearing a Mozart duet, a sense of victory over the forces of gravity and over all human servitude, instants of Paradise. (...) the public staggered from the theatre, stunned, wondering what it was they had just seen. For once, not a bullfight, but a miracle." "Unalloyed joy stirred by the magnificent partnership of Thibault/Ould-Braham ... A perfect understanding, details that only they two can invent, beautifully thought-out stagecraft, and a Third Act beyond all belief, that brought the Bastille to its feet. Blessedness ! "Storm the Bastille on the Saturday for their second performance - they have already scaled the heights, if one is to judge by what one heard here there and everywhere last night!" A fuller account by "Azulynn" can be found on www.ballet.co, May 2007 Internet magazine issue. "(...) I was especially pleased to see that Yong-Geol Kim, a dancer I have long admired, was promoted to sujet. Congratulations, also, to the lovely Myriam Ould-Braham, whose technique and finesse I find exemplary. "(But) Reading about the (2005 POB Internal Promotion Concours) reminded me of last year’s Concours, in which Emmanuel Thibault was finally promoted to premier danseur, after being inexplicably held back - to the frustration of myself and a number of like-minded Opéra attendees. "Unfortunately however, his new premier danseur status does not appear to have resulted in his being more prominently cast in principal roles. While, one might argue, he is not as tall as many of the company’s leading men, there are a number of suitable ladies for him to partner. "He more than proved himself when cast opposite Dorothée Gilbert for that spectacular performance of ’Don Quixote’, and why has he not been given another chance to dance Basilio? And I am not the only one to see that, in the forthcoming performances of ’La Bayadère’, he is stuck once again in the cameo role of the Golden Idol." "The Greats come to New York"
"Monday night’s ’Stars of the 21st Century’ gala, an annual event at the New York State Theater organized by Nadia and Solomon Tencer, was not as tacky as many similar occasions held around the world: The dancers did not try to bludgeon their audience with pyrotechnics. And the gala did New Yorkers a great service by enabling them to see some great dancers who visit the city all too rarely,among them Serge Filin of the Bolshoi Ballet and Emmanuel Thibault of the Paris Opera Ballet. (...) I always think of Mr. Thibault as a counterpart to the Kirov ballet’s Vasili Scherbakov; both are unique talents trapped too long in what I call ’pas de trois limbo’ - not allowed to do the principal roles they deserve because of the Byzantine internal politics of their companies. When Mr. Scherbakov finally danced Albrecht in ’Giselle’ in 2004 at the same time as Mr.Thibault danced Basilio in ’Don Quixote’, I wanted to stand up and cheer at what looked like a global convergence. Mr. Thibault’s technical gifts - arrowy tours en l’air, very high cabrioles - were crystal-clear Monday night, encompassed in a movement style that is both plush and astringent." "From International All-Stars, a Mix of Styles"
"They don’t make ballet galas like they used to. ’Stars of the 21st Century International Ballet Gala’ (...) rolled into the New York State Theater on Monday night looking more like a classy variety show. Gone were the wonderfully vulgar showpieces balletomanes used to hate, replaced for the most part by serious-minded solos and pas de deux performed by devotees of the art of dance. One holdover, ’Grand Pas Classique’, was danced, very beautifully, by Mathilde Froustey and Emmanuel Thibault of the Paris Opera Ballet as if it were high art. But glittering old-style dancers are also largely a thing of the past." Towards the end of the aforesaid one-hour broadcast, during which Mlle. Lefevre notably described her friendship with the aleatory composer John Cage, someone (no, not the author of these lines) e-mailed in the following question. Q: "Why is Emmanuel Thibault not cast in the major roles?" Brigitte Lefevre: "DEAR Emmanuel! (Brigitte Lefevre laughs). Now that’s a tough question. "There are 154 dancers, and a few soloists, and amongst them, Emmanuel Thibault. I was a bit sorry that he was not appointed premier danseur earlier, following the various Concours. Now he is. He has many things - he has his artistic life ahead of him. There may be roles that would necessarily be for him. I have already had him dance Don Quichotte. "To my mind - and let’s be frank here - although he has an absolutely extraordinary technique, he cannot dance everything. He has much yet to prove to himself and to prove - but I know that there are spectators - there is even a Website that discusses his work. All this to say the extent to which he has drawn to him the concern and respect of the public. So yes, I do hear your question. "You know, it’s no accident that the étoiles are who they are ... Aurélie Dupont dances Le Sacre du Printemps by Pina and then goes down to dance Don Quichotte wonderfully - and so do others, like Marie-Agnès Gillot. That’s why Emmanuel, he’s a very fine dancer, a splendid dancer, but,"
Olivier Bernager (interviewer): "you mean to say Emmanuel Thibault?" Brigitte Lefevre: "Yes, Emmanuel Thibault, no-one can jump like that, he has exceptional qualities. he cannot dance everything, but he has his whole career before him." "The role [of the Blue Bird], though small, has been danced by legendary artists nevertheless. In 1961, but eight days after defecting [from the USSR] at Paris, Nureyev took the stage at the Théâtre des Champs Elysées (...) alternating in the roles of Prince Désiré and the Blue Bird (....). In 1989, Kader Belarbi was appointed étoile, as it so happens, at the end of a performance in which he had danced the Blue Bird. "In 2005, M. Emmanuel Thibault, premier danseur of the Paris Opera, is now considered to be the role’s leading exponent. Whilst on his journey to Rome to dance at the National Opera, he stopped at Bologna, and appeared at Carla Calcaterra’s daily class at the Associazione Artistica Balletto Giovane. For us, amateur students, it was a privilege to watch him at work, and most especially, to note the great care he takes with detail, those very details that, as I have so often said, are precisely what makes the difference. Happy the Roman public who will shortly see him dance with Myriam Ould-Braham !" 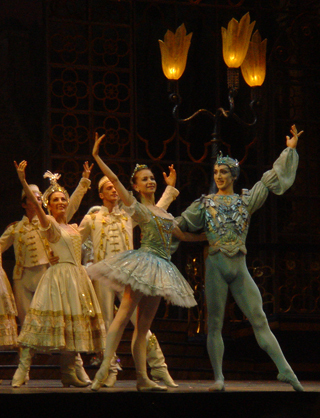 "In Act III, Emmanuel Thibault and Myriam Ould-Braham as the Blue Bird and Florine were the cynosure of all eyes. The two dancers are a veritable treasure of art. Elegant in his gestures, Thibault uses his arms, and his jumps, in such a way that every part of him seems to belong to that being he has created (...) from the moment the pair appear on the stage amongst the other fairy-tale characters, building into the great whirlwind of the pas de deux, they give a breathtaking demonstration of what is the true, the pure French School." At the Concours annuel of the Opera, Emmanuel Thibault was appointed - finally - to the rank of Premier Danseur. For several years now, we have all expectantly been awaiting this outcome, an outcome that straightforwardly reflects what actually takes place on our stage: he has long interpreted with brio, real judgment, and artistic commitment roles normally danced by a Premier Danseur. This Concours thus marks the end of a polemic where rivers of ink have been spilt (....) °there can be no doubt but that the official outcome of the Concours reflects, accurately, what did indeed take place on stage, this past December 23rd. Our new premier danseur is Emmanuel Thibault. The artist presented - as always - variations danced to perfection. The spectator is transported to a world that is no longer that of the Concours, but that of a veritable performance. Then came Emmanuel Thibault, a dancer whose previous unsuccessful attempts to grain promotion have caused much controversy. The tension in the auditorium was palpable; a whole bunch of us were positively willing him on. Remembering that, in a critical capacity, I’m not supposed to be rooting for anybody, I try to be coolly objective: does he have a glaring fault I’ve previously overlooked ? I tried, but I failed. He was as technically clean, not a single millimetre of a shuffle, as anyone I have seen dance this solo. I do not recall a more intoxicating matinee (….) The cause for my delight (and that of an ecstatic public) was the twin debuts (as Kitri and Basilio) of Dorothée Gilbert and Emmanuel Thibault (….) Over the past eight years I have reported on his astonishing technical purity, his vividly communicative delight in what he does - the dance shining. And yet, for reasons inexplicable, he is not promoted (in this hierarchic troupe) beyond sujet, when everything he does speaks of his being a premier danseur. In this glorious matinee, Gilbert and Thibault shared a common delight in the drama as in the dance. Thibault polishes every step, every phrase with what seems angelic ease, and an extra joy was to see fifth positions that are tight, clean, teacher’s-pet-ish. Both made their roles and the ballet magically alert and alive, the most happy - the most happiest - thing. Emmanuel Thibault was, at long last, given the opportunity to shew - and with what brio ! that he is well up to the major roles. He IS Basilio, charming, a shade on the naïve side, an accomplished partner, while his reserves of stamina let him to make light of the technical hurdles, and lend him a virtuosity worthy of dancers on the international circuit - watch his impeccable doubles assemblées, his sequence of tours en l’air in the variation. Long admired for the remarkable quality of his dancing, but, for reasons that are very moot indeed, scarcely-acknowledged in the company, Emmanuel Thibault has proven that he richly deserves to be appointed premier danseur, although he has been refused that rank at every Internal Promotion Concours. From the technical and theatrical standpoint alike, his mastery of the role [as Basilio] was complete (…). Granted, he cannot play every role in the repertory, as he is of slight build, and no more than middling ability when it comes to lifting. That being said, there are a great many lead-roles that are tailor-made for him, and in which he should be regularly cast. It would be a good thing for the Opera to now come round and recognise the fact. "Why restate a manifest truth, one all balletomanes are aware of: whether it be technique, jump, petite batterie, ballon, impeccable cleanly finish - all that, and more, is Emmanuel Thibault (…). [He] need only go down onto the stage, and it is transfigured. The painted backdrop becomes a fair landscape, the ladies walk on air, and music becomes unthinkable without the dance. "The Personification of What it means to be a French Dancer"
I wanted Emmanuel in my film (Serge Peretti, le Dernier des Italiens - editor’s note)because he is an outstanding dancer. He belongs to the old school, to the time of Vestris. His style is refined and elegant, the personification of what it means to be a French dancer. Moreover, he can jump! His elevation is remarkable, coupled with an extraordinary jeu de jambes. Neat, light and precise. He’s an amazing dancer who most certainly does not have the status he merits within the company. "In Wednesday’s performance, Thibault electrified the peasant pas de deux (notwithstanding his effortful partner Dorothee Gilbert). It’s always an indication of unique talent when a dancer shows you something you’ve never seen before, even if, like me, you feel inadequate to describing it. I’ll try: In his landings, each individual element of his leg - feet, calf, thighs - articulated. What I mean is, his precision wasn’t limited to his feet but the expression of every fiber was given attention. And when I say electrified, I’m only being hyperbolic to the extent that we weren’t actually all illuminated, but Thibault’s animated eyes and face were." The two "sujets" quite literally burst out onto the stage in this piece so perfectly attuned to their own character : brio, speed and wild abandon. Danced and interpreted with maestria. Energy and enthusiasm radiated from each step, and swept the public up along with them". Q - In your book (Corps Glorieux, September 2003) you’ve singled out the issue of Emmanuel Thibault, sujet of the Paris Opera. Why ? "I find it quite unfair that one seize upon his rather slight stature as a pretext, and that he be kept carefully away from the great roles. When one has got a dancer of that quality about, why fuss over his partners’ height ? We should be staging ballets specifically with him in mind. The man has fallen afoul of a fad, one that favours very tall dancers, under the impact, in particular, of Georges Balanchine." "(....) Thibault in the taxing male role [Pas de trois - Paquita] which demands a perfection of technique beyond the reach of most, was simply stupendous. Nijinsky himself who danced the role in 1907 could have wished for no better substitute. Thibault, light, quick, neat, aerial, with giant leaps in immaculate style where he hung in the air, is now one of the finest dancers of his generation in the world. Buoyant and joyous, he revelled in every minute of it (...) Legend has it that the wonderful pas de trois, known as the "pas de trois in gold", brings luck to its interpreters. It’s certainly time that Emmanuel Thibault, repeatedly chosen by the classical choreographers, is brought more frequently to the forefront of the scene." Critics’ choice for Best Dancer 2002/2003 "in virtually everything he dances - his promotion to premier danseur is long overdue"
"Emmanuel Thibault’s riveting entrances and daunting exits into the wings of the Third Movement of Symphony in C, thus, were the most exciting moments of the Paris Opera Ballet Balanchine Triple Bill on Wednesday the 15th. Simply because the man soars as if suspended by an invisible string or lifted by silent gusts of a benevolent wind, and because he carries himself beautifully up there. Back on the ground he knows how to modulate accents without making them look strained, he gives full shape to his pirouettes, while his port de bras draw wonderfully clean arcs and lines around his centre. "In a company of outstanding artists, Thibault is one of a handful of Princes of Dance - Manuel Legris, Laurent Hilaire, José Martinez and Jean-Guillaume Bart being the others - and the only one with such a superlative gift and outstanding facility for classical ballet dancing. He is also the only one who is not an étoile and, sadly and unfairly, never will be. (Thibault must be close to 30 and is still a Coryphée). Worse still, he only gets cast in soloist roles very infrequently and was given just this one performance of Symphony in C."
"It is difficult for a consensus of opinion to exist about anything in ballet as dance fans tend to have extremely subjective views, but a consensus certainly seems to exist where Thibault is concerned, not just amongst the French fans but also among the UK contingent of POB supporters. "Emmanuel Thibault’s standard of excellence is such that the first sight of him hits you like an express train - he is that good! Being London based I have to rely on others to assure me that he always dances outstandingly and I can confirm that there is absolute fury in Paris that he is treated so shabbily by the powers that be. "I too have heard that he is a poor partner, well, Nureyev himself sometimes disappointed in the lifting department and in my thirty odd years of watching the POB I’ve seen lesser talents with the title of étoile. Certainly some sort of explanation as to his continuing exclusion from that rank needs to be made." Miss Barnstable has watched most Covent Garden productions staged since 1963. "(...) Emmanuel Thibault, as astonishing in the set variation from the Mazurka (Etudes) as in the marvellous solo "Autumn" from Jérome Robbins’ Four Seasons. How could one possibly dance better, more fluently, or with keener intellectual focus ? Notoriously, however, Emmanuel Thibault, greatly loved by the public, is not a popular fellow within the inner cogs and wheels of the Opera, which, for several years now, has refused outright to promote him to the rank of Premier Danseur, no matter how extraordinary his work. One fails to see how anyone might argue that he be a mere "Gold-Medal Collector", after the masterful lessons in style he has just given in Pierre Lacotte’s "Paquita ", not to speak of his willingness, whenever called upon, to stand in for someone taken ill !" "The Act One Pas de Trois led to a resounding triumph for the sujet Emmanuel Thibault, on account of his fluency, elevation, and ideal style. It was Nijinsky who held the role in 1907 (...) and he could have done no better." "The Concours results were announced shortly afterwards (...) Leaving press and public dumbfounded, there was one name lacking - that of the Sujet Emmanuel Thibault, who had quite outshone his peers (...). At last year’s Concours, the Jury and Management had simply decided to promote no-one at all, rather than appoint Emmanuel Thibault, who had, again, prevailed. Could there be a clearer way to get across to an artist that he is unwanted, and that there is little point in turning up for the Concours, at the very moment that he ruled the stage in Pierre Lacotte’s version of "Paquita ", giving a sovereign demonstration of the French School’s accomplished style ? Alas ! This Concours, that should have been an explosion of happiness at the appointment of Eleonora Abbagnato, a day for rejoicing and celebration, has been utterly wrecked by the injustice deliberately perpetrated upon Emmanuel Thibault." Title: "SCANDAL AT THE CONCOURS DE L’OPERA"
"The case of Emmanuel Thibault (...) who, for the past three years, has found his path to the position of premier danseur blocked off. Each and every year, he has been the best of the Concours, and each and every year, he has not been promoted. Yet again, this past Wednesday (...) he shewed himself to be extraordinary. Light years above everyone else. Virtuoso, light, musical, catlike, frolicking through the most devilish technical problems. Such ease astounded even the professionals. And this time, one hoped against hope that he would at last be promoted. There were two premier danseur positions available (...)° Tears were shed, of rage and injustice. Two other people were promoted (...) good dancers, of course, but the performance they put in at the Concours was well below that of Thibault...."
"Two posts of Premier Danseur were available this time round, and the performance [at the 2001 Concours] in February, sublime, of Emmanuel Thibault left no doubts at all that one of them was his. In the imposed variation, surprisingly again from La Bayadère, he soared through the air in a superb demonstration of what dance is all about (...) This time, he had nothing to lose, for rumours had gone out months ago that even should he dance like Nureyev, Vasiliev and Baryshnikov rolled into one, he was not to be promoted. And so he was not. "(....) What is happening at the Paris Opera ballet where dance alone should be king ? There was a time when this competition gave every dancer their chance. Is it now being turned into a beauty competition where only those resembling a stereotyped story-book image of a prince can pass ? Or must dancers grovel at the feet of a bunch of civil servants and beg ? This wilful and systematic blockage of such a unique artist as Thibault puts not only the whole concept of a "competition" into question, but strikes a blow at the very foundations of the company. "After this frankly shocking result, I asked jury member Nicolas Le Riche to explain what had happened (...) [he said] "All I can tell you is that it is very hard to be on the jury (...) It’s as if you had to vote for the best composer between Beethoven, Tchaikovsky, Brahms and Mozart, and Emmanuel Thibault was Mozart". "It would have been more correct to have commented that what we saw then, was Mozart in a sea of Salieris." "M. Emmanuel Thibault, that extraordinarily brilliant soloist (whose partnering has, by the bye, markedly improved), has still not been promoted premier danseur. Yet again, he is paying a high price for his particular physical constitution, one better suited to the very rigorous demands that classical academic dance calls for, than to fashion shows (Oh, and while we’re at it, here’s news: in April there will be a fashion show by Yoshiki Hishinuma at the Opera), fashion shows where Karl Paquette and Jérémie Belingard, the two youths who were promoted, would most certainly not look out of place." "As for Emmanuel Thibault, who sailed far above his peers in the sujet category, yet again, he was cheated, robbed of a first place which, to the mind of most observers, was as of right, his own (...) Whenever the Thibault issue is raised, we are told that his partnering is not the most secure. Well, if the Paris Opera Management purports to advance that argument, may it assume responsibility for so doing ! but the feeling that injustice has been perpetrated remains nevertheless. What prospects might there now be for this young and talented man ? Will he not be compelled to seek his fortune elsewhere ?" "The Spectre de la Rose was danced - magnificently - by Elisabeth Maurin and Emmanuel Thibault. The spectre - a true enchantment. Elisabeth Maurin, her eyes half-closed, a delicate, touching sleepwalker, was poetry itself. Each of her gestures, without a hint of preciosity, is true, telling, and withal, veiled in grace. In the presence of Emmanuel Thibault, one forgets that this is a human being of flesh and blood. Supple, riding the airs, he carries off with subtlety and without (apparent) effort, the role’s technical feats. Nary a sound as he alights from a jump or a perilously off-balance double tour en l’air. With light arms and an intriguing smile, silence rhymes with seduction as he suavely traces the Labyrinth of Love, an ideal echo of Gautier’s poem. Beautifully restaged [by Pierre Lacotte], this short ballet has taken on afresh, the aura of a masterpiece." In his film on Maître Serge Peretti (The Last of the Italians), Dominique Delouche has cast M. Thibault in the opening scene (The Tambourine Player). In the about-to-be-released Paris Opera DVD of Pierre Lacotte’s Paquita, the gentleman dances the role taken by Nijinskii, in the Act I Pas de Trois. Clement Crisp, in the Financial Times, December 2001, Review of the year 2001 (currently available on Internet, only to subscribers of the above newspapers).